We can abandon Bushism and still care how states treat their people. A response to Charles Kupchan and Adam Mount. Charles Kupchan and Adam Mount are right that we cannot construct an effective new international order consisting only of Western allies and non-Western democracies [“The Autonomy Rule,” Issue #12]. If we are serious about establishing regimes for climate change or nuclear non-proliferation, or fostering an international financial system, then we have to deal China, Russia, Saudi Arabia, and other autocratic states into the system. The imperative of such an effort is reason enough, as they rightly note, to discard the “you’re-with-us-or-agin’-us” Bush-era worldview. So far, so good. But Kupchan and Mount do not just go so far; they would have us abandon not only the worst errors of Bush but some of the nobler impulses of American foreign policy of the last several generations. That’s a mistake, because their sense of what the world looks like is plain wrong. The argument of “The Autonomy Rule” goes as follows. The liberal democratic order built by the West after World War II is “steadily losing its sway” as non-Western, non-democratic states come to the fore. Because we need these states to fashion an effective global order, we must “make room for the competing visions of rising powers,” and we should welcome any state that seeks to advance the welfare of its people, whether by democratic governance or not. Doing so would honor our own pluralist traditions and would help us forge consensus, both in confronting predatory states and in attracting otherwise refractory regimes into the world order. Empowering non-democratic but “autonomous” states would fortify the regional bodies that represent many such states and provide a motive to abide by the rules of free trade and free markets. Let’s start with the central premise: The “Western order” of liberal democracy is losing its sway. Certainly the Western share of global GDP is diminishing–though the United States is still three times the size of its next-largest competitor, and little Canada still generates significantly more economic activity than India. More importantly, “the Western order” would be losing its sway only if the non-democracies of the non-West were eclipsing the democracies, and that scarcely seems to be so: Of the 15 non-Western countries in the top 25 of the GDP rankings, eleven are democracies, and only four–China, Russia, Iran, and Saudi Arabia–are autocratic. But what about the broader “democratic recession” we’ve been hearing so much about recently? Certainly the “Third Wave” of democratic expansion that began with the end of the cold war has ebbed. But Freedom House, which tabulates such things, notes that from 2000 to 2008 the number of countries ranked as “free” increased by three, while the “not free” category shrank by six. Thomas Carothers, a scholar of democracy generally inclined toward pessimism, recently wrote that “the overall balance sheet for democracy in this decade relative to ten years ago is surprisingly close to neutral”–not a ringing endorsement, but scarcely cause to abandon the enterprise of democracy promotion. On one level this is right: The immense variety of economic and social systems among democracies shows that people do, indeed, frame institutions according to their taste. However, we are not just talking about democracies, but also countries like, say, Egypt or Angola. What can we mean when we say that “societies” in such nations have “organized” their institutions? No one has ever seriously asked their opinion. Their institutions have been ordained from above. What about the theocracies, like Saudi Arabia or Iran? Should we suppose that putative proximity to the Divine satisfies some distinctive national requirement of human autonomy in these states? Given the degree of frustration and embitterment in both places, this would be a hard case to make. Of course the authors are thinking more of China, or Singapore, where citizens seem quite happy to exchange political freedom for astonishing economic growth. Though no one asked these societies how they wanted to organize their institutions either, we can infer their consent from relative states of social tranquility. But there aren’t many Chinas or Singapores. With its anthropologically correct view–that different peoples choose different forms of social organization–the Autonomy Rule offers balm to the troubled conscience. The cold war realists, whether Hans Morgenthau or Henry Kissinger, entertained no illusions about the tyrannical nature of the Soviet bloc states with whom we nevertheless had to find a modus vivendi. Americans were always uneasy with such hard-headed realpolitik. Kupchan and Mount provide us with a way out: The states with whom we must make common cause offer their citizens the same fundamental good we do–”autonomy”–but through different means than we choose. Only the most predatory states–Zimbabwe, North Korea, Sudan, and presumably a very few others–fall so far short of this standard that they do not merit such deference. There is reason to believe that Kupchan and Mount have some fellow travelers in and around the White House. President Obama and his chief aides have been aggressively distancing themselves from George Bush’s Freedom Agenda. Obama has made efforts to rebuild ties with Russia tattered by that country’s naked act of territorial aggression against Georgia. In his recent speech to NATO, the president said nothing about placing Georgia and Ukraine on a path to NATO membership, a Bush hobbyhorse. And in discussing Afghanistan, he did not utter the word “democracy” once. Obama’s apparent allergy to that word, so beloved of his predecessor, is troubling. The Administration has said it will not condition aid to Egypt on domestic reforms. And when Secretary of State Hillary Clinton visited China, she declared that human rights abuses “can’t interfere” with progress in other areas–a source of obvious relief to the Chinese leadership. If, then, we strip away the comforting hokum about the diversity of forms in which societies choose to organize themselves, and dispense with the dubious claim that “economic, demographic, and military trends favor ascending authoritarian states,” what remains is garden-variety realism: Kupchan and Mount would have us deal with states according to their interests, not according to their internal political organization. It is worth recalling how we came to abandon this hard-headed view in the first place. Bush and Condoleezza Rice arrived in office as devout realists. Then came the terrorist attacks; and it became clear that the insides of states mattered to us very much indeed. “Realism died on 9/11,” as a State Department official once put it to me. A more just and democratic Middle East suddenly looked like a matter of long-term national security rather than merely an American mission civilatrice. Of course, we all know what a mess came of that. Bush made a much better case for realism by default than his father had by practice. Telling people that you want them to adopt democracy so they don’t come kill you is not a very effective argument. And yet putting ourselves explicitly on the side of democracy, rather than simply forging alliances with “moderate” authoritarian states, was the right thing to do. Democracies are, on balance, more peaceable, more prosperous, and more stable than autocracies. They are less likely–on balance–to foster terrorism. And people want democracy–they want a voice. So-called “liberal autocracies” may offer voice enough for people. 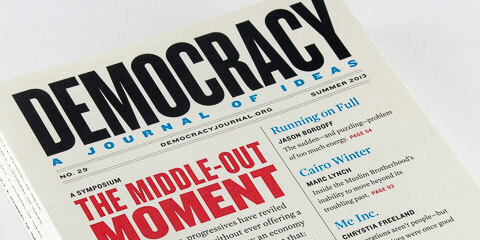 But few autocracies are liberal; and people seek autonomy by clamoring for democracy. What’s more, we no longer live in a world where statecraft plays out as a game of elites. People see what we do, even if through a distorted lens; they judge what we do; and our ability to act in the world is constrained by those judgments. The Bush Administration was so blind to this central fact of modern life that its leading figures publicly championed our right to torture people even as they raised the banner of human rights and democracy. Obama, on the other hand, intuitively understands this new fact of international affairs. In a major foreign policy speech during the campaign, he observed that politicians typically get to see desperate people in places like Darfur from the height of a helicopter. “And it makes you stop and wonder,” he said, “when those faces look up at an American helicopter, do they feel hope or do they feel hate?” Obama’s premise was that our national security very much depends on the answer. But there is an unresolved tension at the heart of Obama’s approach. On his first trip abroad, Obama spoke directly to the hopes and aspirations of the people he encountered, even as he sought to repair the damage of the Bush years by speaking just as respectfully to some of the authoritarian regimes that Bush snubbed. How long he can keep up this balancing act? You cannot persuade people that you’re on their side if you are just as unequivocally on the side of the regime they resent. Obama does not like having to make such choices, and perhaps feels he doesn’t have to. But the time will come when he will be forced to choose. One of the Bush Administration’s many mistakes was to believe, or rather to speak as if it believed, in One True Answer–i.e., the Freedom Agenda. But it’s a complicated world out there. If we are to construct new mechanisms of global governance, we have to assimilate realism’s respect for competing definitions of self-interest. But we also mustn’t be agnostic about the insides of states. Democracy matters. This is a lot to ask. Thank God we now have a President who can hold more than one idea in his head at a time. We have to hope that he can practice a less myopic form of realism than Kupchan and Mount propose. James Traub is a columnist at foreignpolicy.com and teaches U.S. foreign policy at New York University. His new book, What Was Liberalism?, will appear in 2019.